Owing to the support of our adroit professionals, we have been able to provide our clients a high quality assortment of Automatic 4 Head Jam Filling Machine. 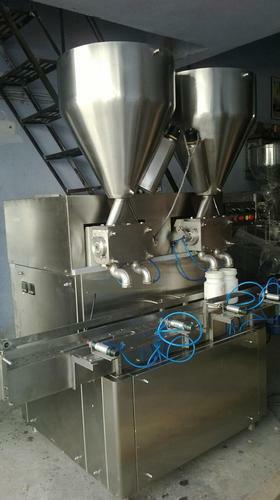 Equipped with a special heat resistant cylinders and jacketed hopper for hot filling, this machine is widely used for filling sauces, curry pastes, ready to eat foods, fruit juices, ketchups and adhesives. Widely used in various industries, this machine is offered at highly affordable price to the clients. Easy filling quantity setting through electronic reed switch sensor system. Volumetric displacement pump based filling system. 5 ml- 50 ml 15-18 strokes per min. 50 ml-500 ml 10-12 strokes per min. 100ml- 1000 ml 8 strokes per min. We, All Pack Machine from 1996 are manufacturing a high-quality range of Turntable Machine, Sealing Machine and many more. All offered products are designed using quality tested materials. The provided products are extensively appreciated amongst our customers for their longer life, high efficiency, low maintenance, sturdiness, flawless finish, and sturdy designs. Apart from this, all these packaging machines are highly used in various industries like Lubricant Oil Industries, Mineral Water Industries, Liquid Blue Industries, Phenyl Industries, Liquor Industries, Hair Oils Industries and many more.